A leading Engineering & Construction Company involved with Refinery / Petrochemical / Oil & Gas Projects in Middle East. 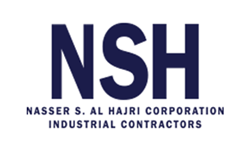 Nasser S. Al –Hajri Corporation (NSH) established in 1978, has grown, not only as the largest but also as the safest working industrial contractor in the Middle East. Being a 100% Saudi Company, NSH work with all major international clients and the customer profile includes Saudi Aramco, SABIC & its affiliates , Qatar-Gas, Ras-Gas, ADNOC, Sipchem, Shell, Exxon Mobil, Total, Qatar Petroleum, Oryx-GTL, Dolphin Energy, Tasnee, Chemanol etc.. Recently NSH executed 2 major jobs for SABIC, simultaneously and achieved over 90 Million safe man hours. With its main head quarters based in Al - Khobar, Saudi Arabia, NSH has achieved a "GRADE A "rating as a general contractor by the Saudi Arabian government.